This webpage describes experiments reported in [Grigore, Yang, Abstraction Refinement by a Learnt Probabilistic Model, POPL 2016]. Generate a list of queries to solve. 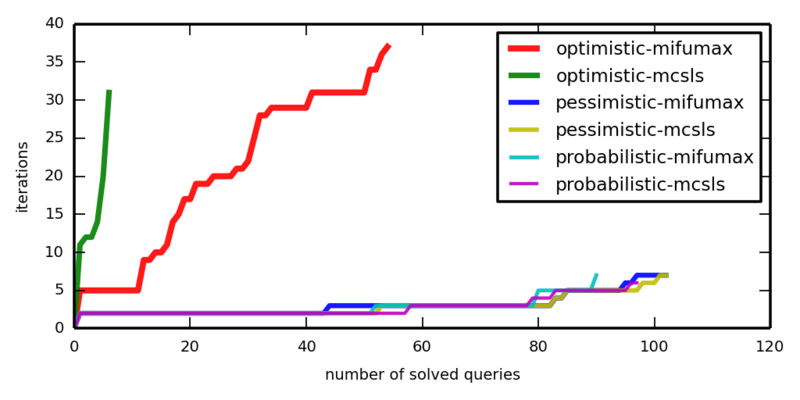 Solve queries in the optimistic (old) setting. Solve queries in the pessimistic (new) setting. Solve queries in the probabilistic (also new) setting. Generate a list (aka script) of queries to solve. where MODE is either optimistic (default) or pessimistic. Warning: This may take a few weeks. You may want to use the -timeout option to change the default. Logs will be saved in a directory named MODE-logs-TIMESTAMP. Learning is done offline, based on provenances. The previous runs didn't save provenances. We will rerun the analysis in pessimistic mode, this time saving provenances. 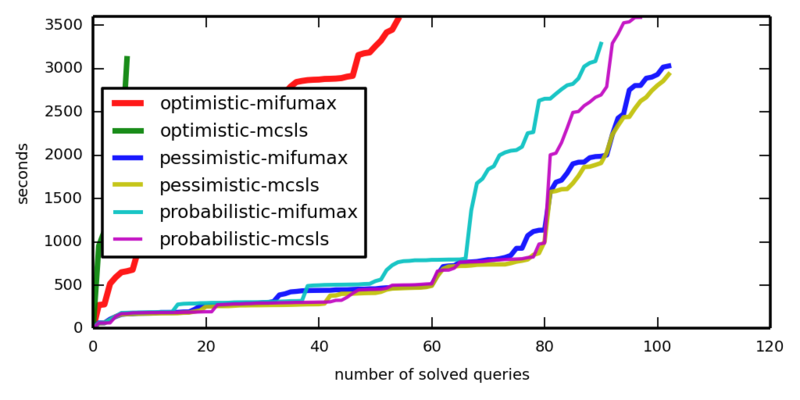 First, we select a subset of queries, which we know are easy. This command creates a file script-for-provenance.txt which is a subset of script.txt that retains queries that were solved in 900 seconds. This step is optional. In principle, it is perfectly fine to try to generate provenances for all queries. However, (a) you'll have to wait a long time, and (b) you'll need a big disk (each provenance takes >100MB). Second, we rerun in pessimistic mode. Third, we collect samples. Be warned that you need a lot of memory for this step: we used 30GiB. Alternatively, you can download the samples from our training set. Here, PROGRAM is one of toba-s, javasrc-p, … The -skip option is used so that model-PROGRAM is learned only from the runs on the other programs. Logs are saved in in probabilistic-logs-TIMESTAMP. For this command, the convention of putting models in files named model-PROGRAM is important! OK, OK: Maybe it's unreasonable to expect you to run this thing for a couple of months. Instead, you could just download our logs and untar them. Of course, it would be better if you produced your own logs. Who knows what went wrong on our servers? Before making pictures, you may wish to check that the three methods agree. Now look at iter-cactus.png and time-cactus.png.